Stocks are looking to close the day red, barring an end of the day rally. It’s been kind of slow to start the week, but things could heat up with the FOMC Minutes tomorrow and earnings from the banks on Friday. I sold most of my positions on Friday and am now waiting for my setups to re-enter. Also, on Friday, I was able to close out the $5k Finale in 3 months. You might recall, last year I successfully pulled off the $100K heist… where I took a $10K trading account and turned it into $100K. That said, I’d like to share with you what I learned about growing a small account, and what worked for me. Less is more, given I was under PDT rule restrictions when I started, I averaged less than 2 trades per week. You have to accept more risk, in the start, I would use about half my capital on each trade. Which is a lot more aggressive than how I trade my larger portfolio’s. And because of that, it’s too hard to diversify with a small account, the commissions alone will eat you alive. Now, if you were wondering what type of trades I took and the game plan behind them, read on to find out, as well as, other tips that can help you if you’re trying to build up a small account. 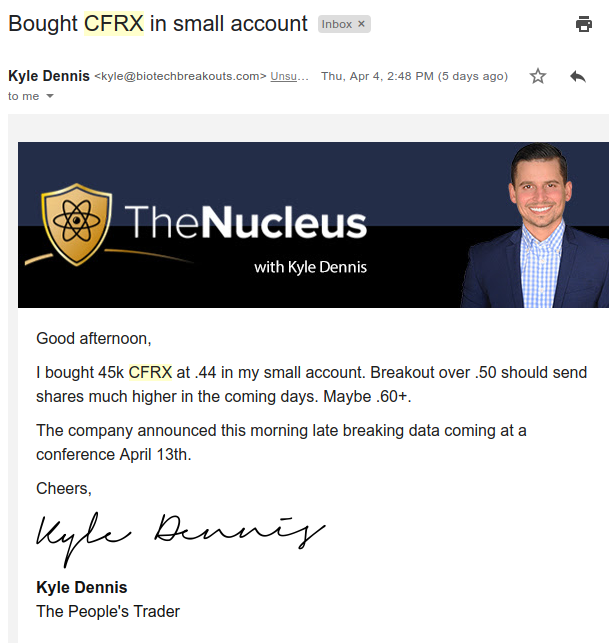 When you’re trading a small account, you have to trade differently… and that’s what I learned with the $5K Finale. After I took a $5K account to $25K… and did it even faster… I realized I avoided all the common pitfalls and trading sins that traders commit. Now, I’ve detailed those rookie mistakes in the 7 Deadly Sins of Trading. Moving on. Let’s get an overview of what I learned with the $5K Finale challenge. I didn’t go around looking for different strategies out there. I already have market-tested strategies… so I kept the strategy exactly the same. However, what I did change were the time frame and stock selection. When you trade a large account, you can afford the luxury of buying and holding stocks for weeks on end. However, with a small account, when you’re trying to generate high percentage returns… well, you need to be a little bit more active. For example, my strategy involves looking for potential catalysts, while pairing those with bullish charts. If you’re interested in learning more about how I scan for stocks to trade, check out this free lesson. Now, with a larger account, I’m looking to buy and hold stocks anywhere between 1 to 4 weeks. However, with the $5K Finale, I was only focused on shorter-term trades that lasted only 1-3 days… keep in mind, these trades all had upcoming catalysts and good charts. If you don’t already know, in my regular trading account, I’m scanning for stocks under $10 for the most part… but with a small account, you can’t really do that. Think about it like this, if you have a $5K account… you can only buy around 550 shares of a $9 stock… and you would be using almost all your capital. On the other hand, when you focus on stocks under $2 (which is what I did with the $5K Finale challenge)… you’re able to get more shares, and in turn, get a better percentage return quicker. When you don’t have a whole lot of capital in your trading account… that means you’re going to have to allocate more per trade. For the most part, I would put a large percentage on one trade. However, just because I put around 50% of my capital into any single trade… that doesn’t mean you should too… just risk what you’re comfortable with. Through my experience, allocating a large percentage of your account in stocks under $2 adds up quickly. Not only that, it helps to minimize commission costs. When you pair this with catalyst events and charts… you have an edge. Even though allocating a large percentage per trade increases your inherent risk… you can actually limit your risk with tighter stops on the downside, and conducting your due diligence. That means doing your research and knowing all the potential catalysts, so when you trade a stock, there’s a low probability that bad news or a stock offering is coming – which would negatively affect your long stock position. Here’s a look at some trades and the thought process behind them. 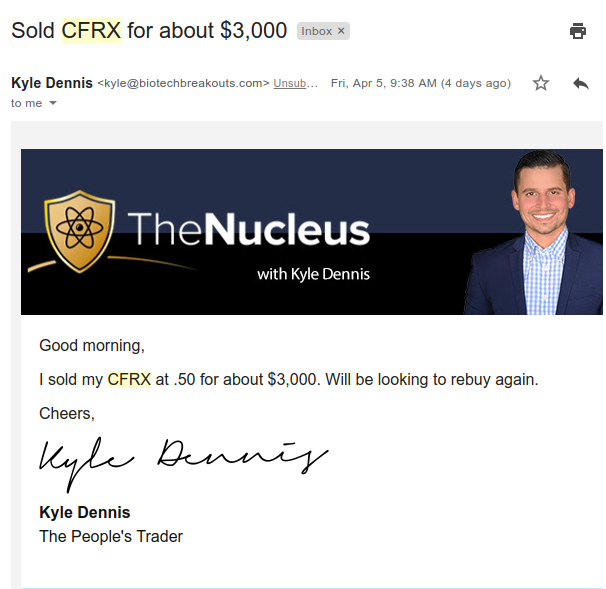 Here’s a look at one example of a catalyst runup in CFRX. Basically, the company announced it was going to provide data on April 13. Now, with the catalyst runup strategy, you want to buy ahead of the event and sell before the catalyst date. Remember, the catalyst date is April 13, so you need to be mindful of when these dates are. The last thing you want to do is hold into an event… because you never know what the company could report or say. 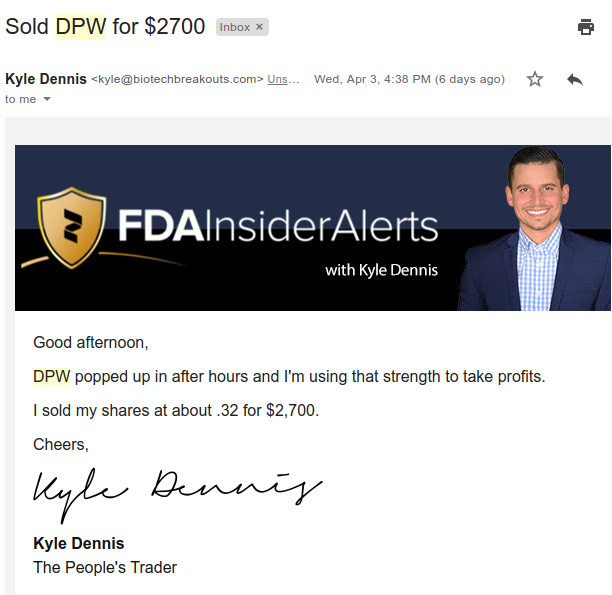 If you look at the time stamps of the emails, you’ll notice I bought shares on April 4… and sold the very next day… locking in $3K. Moving on. Here’s a look at another catalyst trade. With the DPW trade, I knew this stock was a Bitcoin play. At the time, Bitcoin was catching a bid… and actually was flirting with the $5,000 level, yet again. Now, with Bitcoin running, this would pull DPW higher with it. That said, I liked the chart on DPW and bought shares. 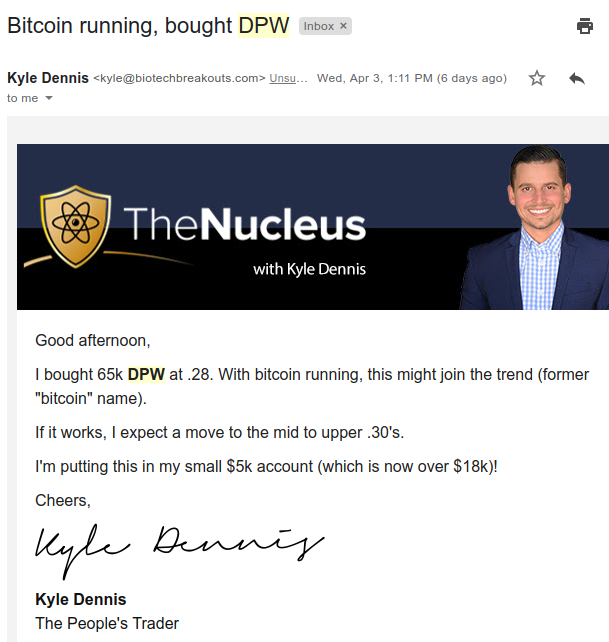 The very same day… DPW popped, and I used that strength to take profits because you never know what Bitcoin could do. If you notice the pattern on these trades… I found a catalyst in stocks under $2, and had enough shares to allow be to get a better percentage return on my account. 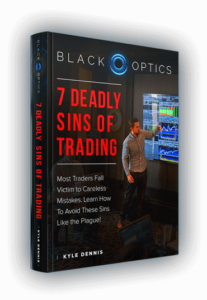 Check out my latest eBook: The 7 Deadly Sins of Trading.